Santana tourist apartments are located in the center of Llanes, in a house of traditional architecture, completely renovated maintaining its exterior personality, but with modern interiors, functional and maximum equipment, thinking of your rest and comfort. 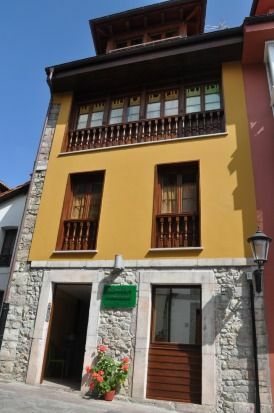 We have 5 apartments in the center of the town of Llanes with elevator, surrounded by pedestrian and commercial area. All just 5 mnts. walking both the Sea and the Mountain. Free Wi-Fi zone in all apartments. The Santana Apartments are located in the heart of Llanes in an emblematic building completely renovated, updated with elevator and free wifi. It consists of 5 apartments and they are distributed from the next. way: - + Studies: Three individual units - two of them with 2 single beds and -One with double bed. - American type kitchen, fully equipped. - Living room with sofa bed and plasma TV. - Complete bathroom with shower. - + ONE Apartment with 2 Bedrooms and Private Patio with Barbecue: - Room with 2 single beds and a room with a double bed. - American type kitchen, fully equipped. - Living room with sofa bed and plasma TV. - 2 complete bathrooms with shower. - Patio with roof and barbecue. - + DUPLEX Apartment: - The lower part has - Room with double bed - American type kitchen, fully equipped. - Complete bathroom with shower. - Living room with sofa bed and plasma TV. - In Upper part you have: - Room with 2 single beds - Television and living room with views of the mountains. - Upcoming Services: .. Pharmacies open 24 hours only 60 meters. .. Children's playground only 80 meters. .. Heated pool, Gym and Municipal sauna only 300 meters. .. Health Center 200 meters. .. Tourist Office one minute walking (100 meters). Viajamos 5 adultos y una niña de 2 años, estuvimos amplios y muy cómodos. El apto limpísimo, en pleno centro pero sin ruido. La propietaria encantadora, todo el tiempo pendiente de nosotros, para que estuviéramos fenomenal. De gastvrouw senora Lopez deed alles om het ons naar de zin te maken en was zeer behulpzaam om advies te geven. De lokatie was zeer goed , op 50 m van het oude deel van LLanes en toch heel rustig en vlak bij een supermarkt en vele andere winkels. Er was ook een auto verhuur bedrijf. Op ca 500 m afstand waren er 2 heel mooie stranden. Estuvimos un fin de semana en estos apartamentos y esta muy bien, el apartamento en sí es muy acogedor y la chica muy simpatica, atenta en todo asique este año volveremos a repetir otro fin de semana porque aparte de que nos encanta Llanes estuvimos genial. Ademas en pleno centro de Llanes, con tiendas, restaurantes y estacion de tren muy cerca. Hemos estado 1 semana en estos apartamentos y la experiencia ha sido muy buena, la propietaria es encantadora y las instalaciones están muy bien. Seguro k volveremos y si puede ser, será al mismo sitio. Gracias Xiomara por tu amabilidad y saber estar! Fuimos a Llanes del 11 al 14 de julio,en mitad de San Fermìn,nos alojamos en el apartamento Tierra y nos quedamos encantados con el pueblo y los alrededores,unos paisajes preciosos,el apartamento es sencillo pero completisimo,tenia de todo......,y la propietaria fue encantadora y amabilisima,totalmente recomendable,volveremos en cuanto podamos.Gracias por todo Ziomara.